Beggars All: Reformation And Apologetics: Luther Condemned the Word "Trinity"? 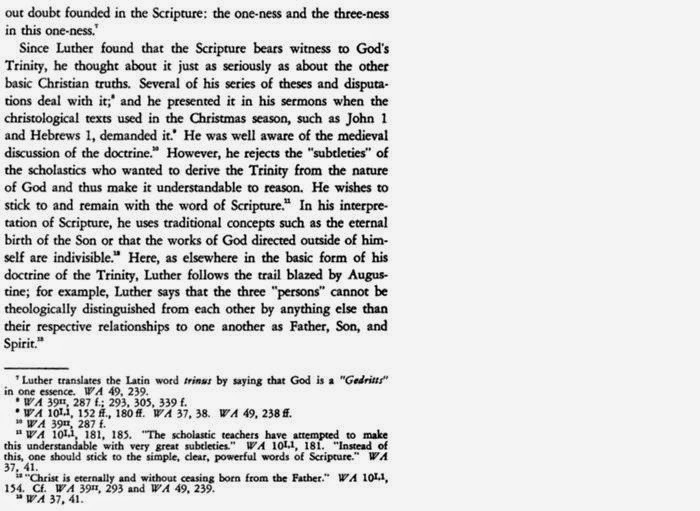 Luther Condemned the Word "Trinity"? "does anybody have documentaiton [sic] on Luther's criticism of the word 'Trinity'? I read about this in Newman, but don't have a source (I don't recall Newman giving one)"
I've been searching around looking for exactly what Newman may have been referring to. Given the examples he uses, it's obvious, his Luther scholarship was a bit weak. 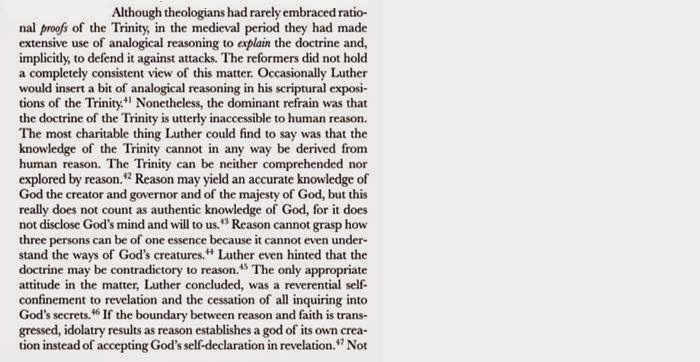 That is, he repeats the popular Roman Catholic polemic against Luther. This word signifies that there are three persons in God. It is a heavenly mystery which the world cannot understand. I have often told you that this, as well as every other article of faith, must not be based upon reason or comparison, but must be understood and established by means of passages from the Scriptures, for God has the only perfect knowledge and knows how to speak concerning himself. The source for this quote can be found here in a limited preview with some pages missing. The full text can be found in the Complete Sermons of Martin Luther Volume 2 (Grand Rapids: Baker Books, 2000), vol. 2.1 p. 406-407). In this early sermon from 1522, Luther goes on to vigorously argue for the Trinity from the Bible. The great universities have invented manifold distinctions, dreams and fictions by means of which they would explain the Holy Trinity, and have made fools of themselves. We shall therefore quote only passages from the Scriptures in order to determine and establish the divinity of Christ. In the first place, we quote from the New Testament, where we find many proof texts; for instance, John I, I-3 : "In the beginning was the Word, and the Word was God. The same was in the beginning with God. All things were made through him; and without him was not anything made that hath been made." Now if he is not made, but is himself the Maker, he must indeed be God. John also says afterwards: "And the Word became flesh." [Sermons of Martin Luther 2.1 p. 407]. 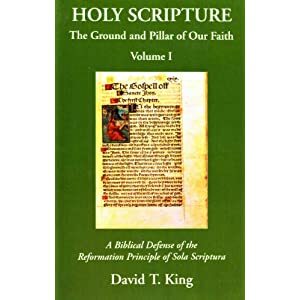 He concludes a few sections later, "Therefore we cling to the Scriptures, those passages which testify of the Trinity of God, and we say: I know very well that in God there are the Father, the Son and the Holy Spirit; but how they can be one I do not know, neither should I know it." 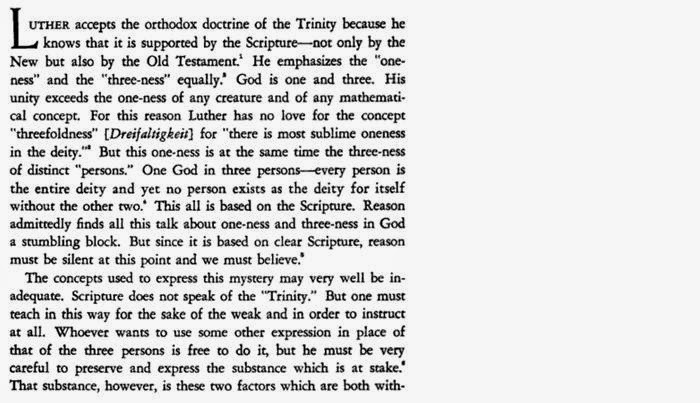 Elsewhere Luther comments on the inadequacy of the term "Trinity": "The words trinitas, unitas are really mathematical terms. And yet we can't talk about God without using such words. But at the same time, it is also true that when we use human language to speak about God, it seems to have a ring to it, a whole new connotation" [Complete Sermons of Martin Luther Volume 6, pp. 206-207]. "True [Trinity] is not choice German, nor has it a pleasing sound, when we designate God by the word 'Dreifaltigkeit' (nor is the Latin, Trinitas, more elegant): but since we have no better term, we must employee these" [Complete Sermons of Martin Luther Volume 4.2, pp. 7-8]. I'm sure a plentiful supply of similar sentiment from Luther could be brought forth as testimony to the fact he didn't deny the Trinity, and also used the word positively. First it's asserted The Trinity didn't concern Luther. Then it's asserted the Trinity was left off the 95 Theses. Interestingly, the Trinity does appear in Luther's earlier Disputation Against Scholastic Theology, but in no sense important to the charge being asserted. Perhaps the writer is intending to say, "the Trinity should have been the 96th point." That is, the author of the web page finds the Trinity to be a heretical concoction of the Roman Catholic Church. This is probably the sense in which it's intended. Sorry to do this to you James, but I can't comment on articles you post on AOMIN. Please forgive me for taking some space here for that purpose. Your article about Dr. Sippo is extremely interesting, particularly regarding the double standard so evidently in display. I'm wondering; should I credit Dr. Sippo or "editor" Patti with all the typos? Patti cleans up the insults, not the spelling errors. To actually view an unedited Sippo post is close to impossible. Patti edits them about 5 seconds after he posts them.